Some more entries for VV in the Wild free t-shirt giveaway have arrived, and they're muchos buenos. The deal again is - you send us a photo of Vintage Vantage stickers or shirts you've spotted in real life. We send you a free t-shirt. Everybody smiles and dances. 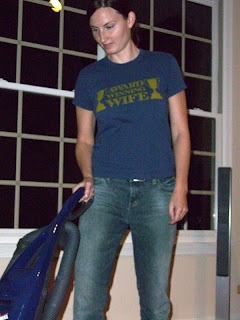 First off, here's Stephanie doing whatever it takes to hang on to her Award Winning Wife shirt. 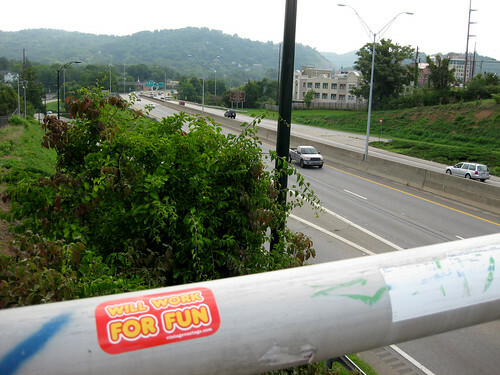 Finally, here's a Vintage Vantage sticker spotted by Lindsay Lucifer on the I-240 overpass in beautiful Asheville, NC. BLACK FRIDAY SALE OMG WTF!!! VV at the Indie Mart in SF! Get Your Nicaraguan Surf Shacks Here!